Below, the two photos, cheek by jowl. Click to see them bigger. Top photo is from the 1965 Crusader, the yearbook of Woodrow Wilson High School; I found it on Flickr, here. 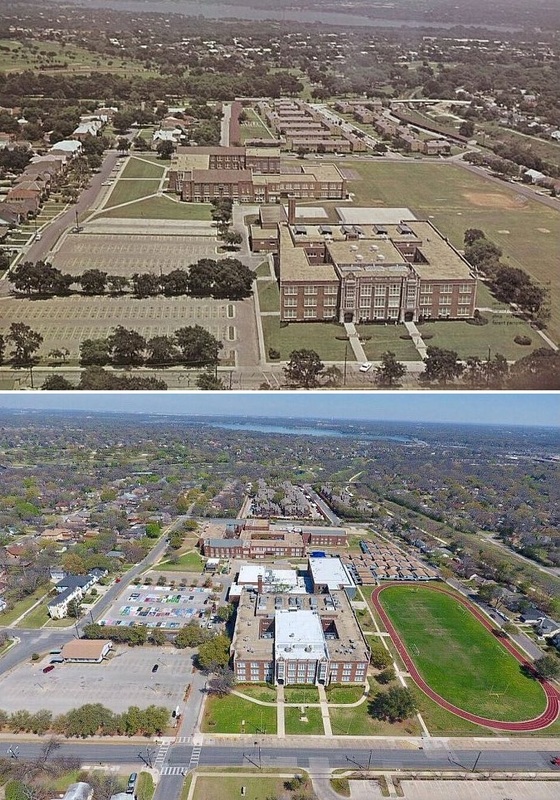 See another bird’s-eye view of both campuses — but one looking to the southwest rather than the northeast — in the Flashback Dallas post “J. L. Long, Woodrow Wilson — 1958,” here. 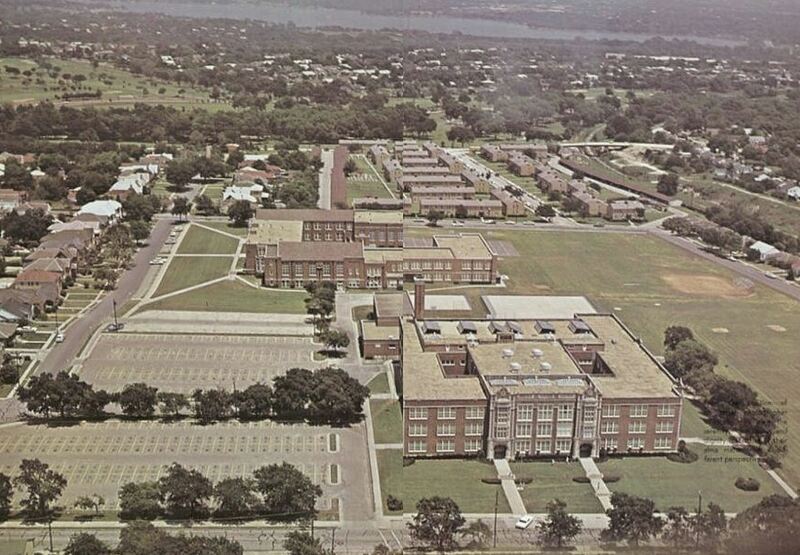 I attended Long Junior High School 1958-1960 (8th and 9th grade). There were “temporary” buildings then. They probably still existed when the photo was made, but are out of sight to the NE of the J.L. Long building. I believe they were originally some sort of military building. At least we called them the “barracks.” I think I recall that they were mostly used for study hall. When I moved on to Justin F. Kimball H.S. 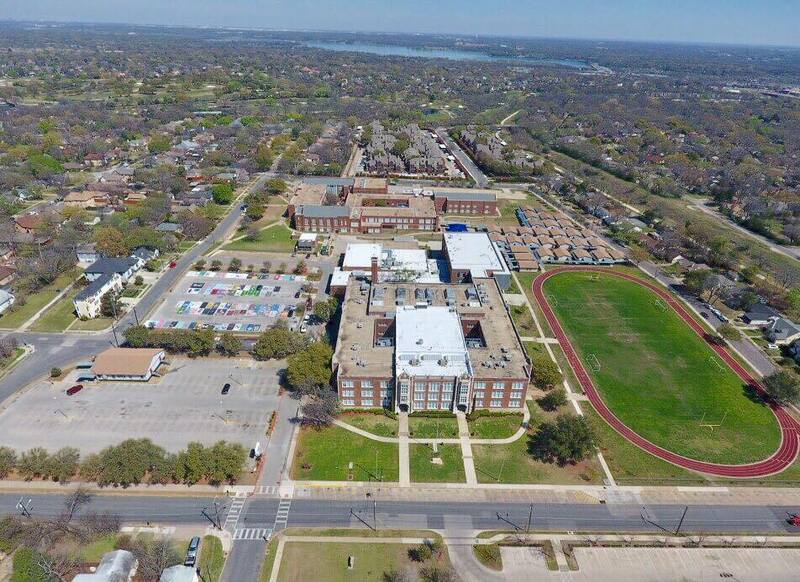 in Oak Cliff to start my sophomore high school year, there were no temporary buildings, despite the intensely crowded junior high/senior high building. For some reason, that was a point of pride for most of us Knights, given that we had attended a junior high (most went to Stockard) unless we were at Kimball for junior high.